Canon's new all-rounder is aimed at beginners. The line-up of Canon EF-S lenses has grown with the addition of a new 55-250mm f/4-5.6 IS II telephoto zoom, the company has announced. Aimed at beginner photographers, the all-rounder will be sold separately, priced £329.99, or as part of a double lens kit with the recently announced EF-S 18-55mm f/3.5-5.6 IS II Canon lens and EOS 550D, EOS 600D and EOS 60D camera bodies. Among the Canon lens's features are a four-stop Image Stabilizer to counter image blur during low light, an Ultra-Low Dispersion lens element and Canon 's Super Spectra Coatings. 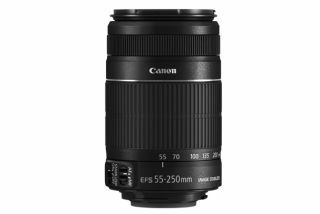 The EF-S 55-250mm f/4-5.6 IS II Canon lens will be available from July 2011.